Technology that enables faster sharing of vital information about a motorcyclist or cyclist involved in an accident is being rolled out with the help of a road safety group. The Sussex Safer Roads Partnership (SSRP), made up of local authorities and emergency services, is supporting the rollout of QR code stickers that carry personal information about the rider. The stickers are designed to be fixed to a crash helmet and can be scanned by emergency services for personal and medical information. 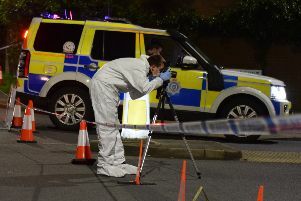 Graeme Beattie, road safety officer at East Sussex County Council, said, “Any opportunity to provide first responders and the emergency services with marginal gains in the golden hour after a road traffic incident has to be supported. The iCEQR (In Case of Emergency Quick Response) stickers have been produced by CERQL – a company with expertise in this kind of technology – and will be handed out to motorcyclists and cyclists. iCEQRs contain a QR code which, once scanned, reveal critical personal or medical details of the individual to first responders or the emergency services. On receipt of an iCEQR sticker, the rider or road user uploads details to the Internet via a personalised and secure web document, which can be updated at any time. In conjunction with the initiative, from April 2015 South East Coast Ambulance Service (NHS) will be issued with computer tablets pre-installed with QR readers. Throughout 2015, SSRP will be demonstrating and educating motorcyclists/cyclists at events across the region on the use of technology to enable faster sharing of critical personal information in emergencies, with free iCEQR stickers being given out to the first 5000 visitors to their stand. More information about the initiative can be found at Eastbourne Magnificent Motors at the Western Lawns – May 2 and 3; Eastbourne Cycle Festival on the Western Lawns – June 13 and 14; and Eastbourne 999 – July 11 and 12. The SSRP uses encouragement, education, engineering and enforcement to reduce road collisions in Sussex. It focuses on changing the road user behaviours that can result in death and injury by using years of experience and research.